Well the pace hasn’t gotten any more relaxing around here—no eating of bon-bons while reclining on the chaise happening any time soon. So I’m cheating again on the blog, treating you to a few of this week’s Instagram pics, so at least you’ll know that the colors are changing, and pink and purple (oh my!) have appeared. I swear the lilacs are early (maybe they like cold winters? I think I heard that). 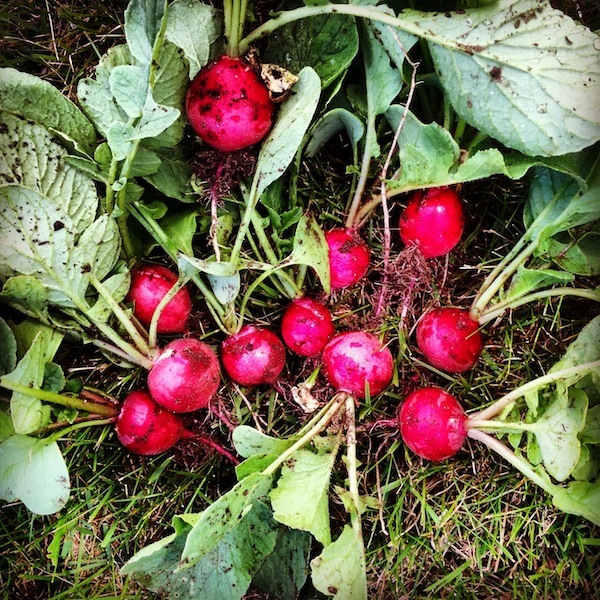 And the radishes are right on time. I did such a good job with the spring bok choy (that’s the lovely purple variety below) that naturally I had to screw something else up. 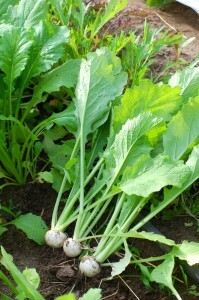 After growing beautiful Japanese turnips last spring, this year I planted them too close together and never thinned them. 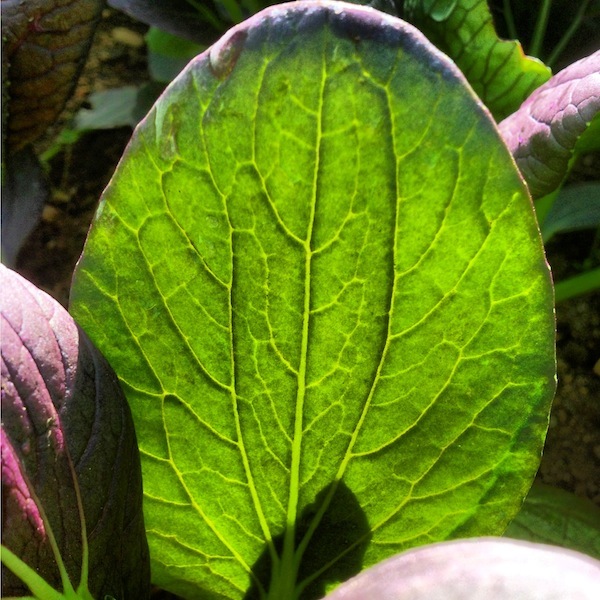 We have some lovely Ruby Glow romaine lettuce (above) about ready to harvest. There are zillions of strawberry blossoms. And the peas (and everything else) are breathing a mega-sigh of relief today with some long awaited rain. My dear farm helper Laura (more on her another time) helped me plant 16 of our tomato seedlings in the hoop house this morning and transplanted the first of hundreds of basil seedlings in the other hoop house bed. And everywhere you look, there’s something else to do. 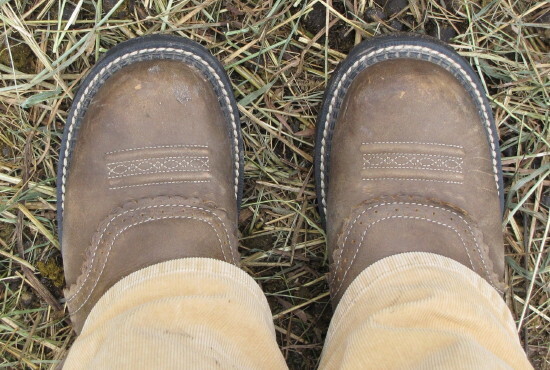 Why, there goes Roy on his tractor now…heading out to the back field to get the tomato rows ready. 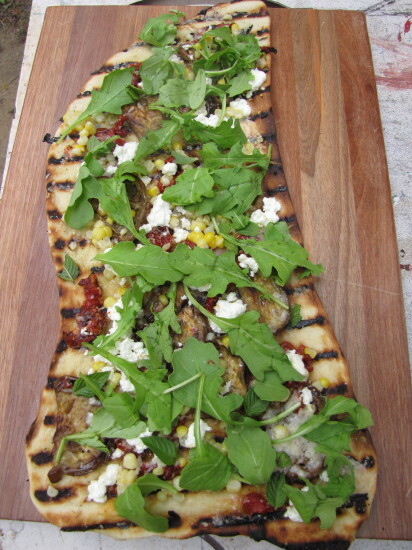 Before you know it, we’ll be grilling eggplant. 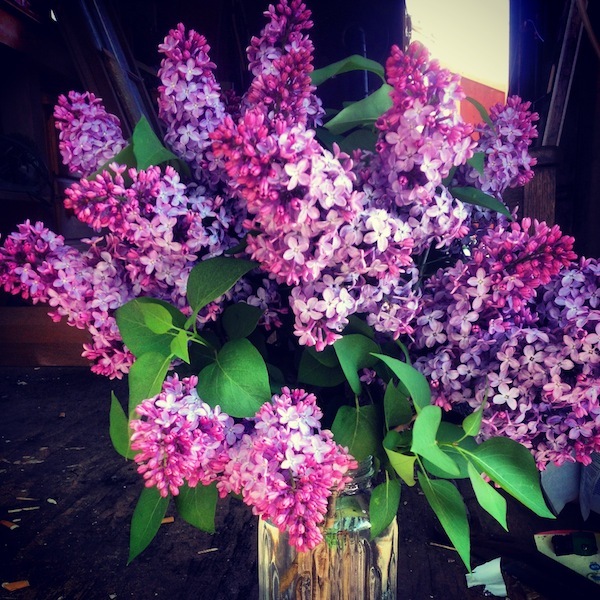 Just a reminder to stop and smell the lilacs (and eat the baby turnips) while you can! 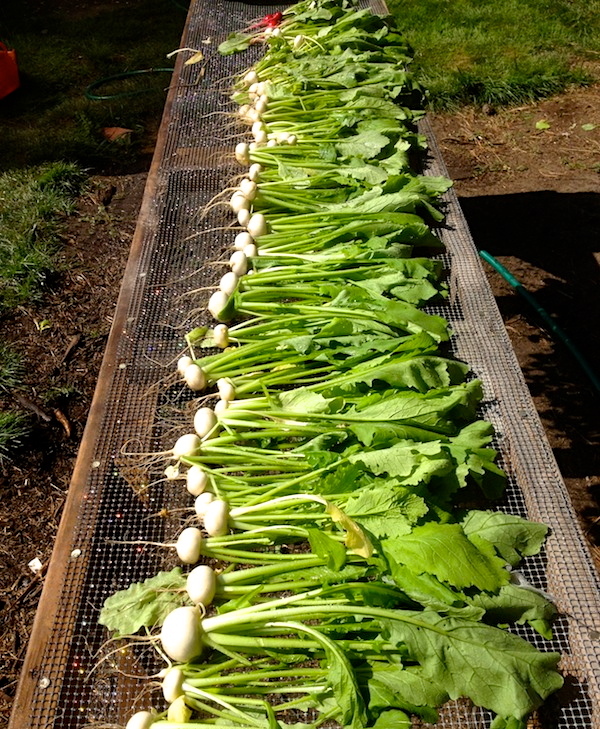 Flipping out, I am, about our beautiful turnip harvest. 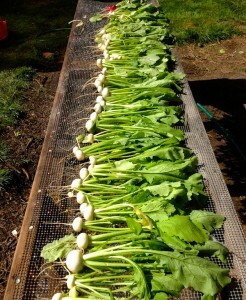 For the first time, we planted a lot of fall turnips–almost 200 linear feet, which translates to hundreds of turnips. Better still, the greens are lush and not riddled with pest holes. The bulbs are plump and beautiful and also (so far) pretty damage-free. (We harvested the first roots yesterday and more today.) With the drought we’ve had, we were forced to turn the sprinklers on every day, and I think maybe the turnips really appreciated it. 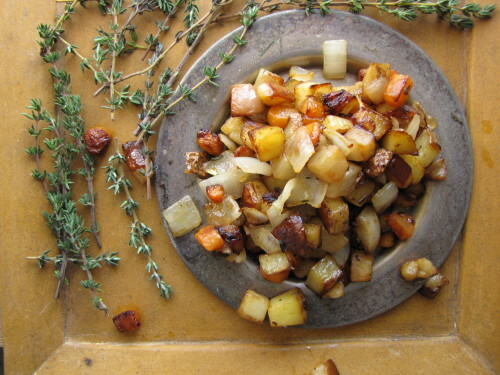 And while we still have pears in mind from last week’s post (I’m doing another batch of honey-vanilla-roasted as I write), I wanted to remind you of one of my favorite quick recipes for roasting turnips and pears together and finishing with rosemary before I forget! (I’m pretty psyched that we have pears and turnips together on the farm stand right now, but I keep forgetting to put copies of that recipe out there!) 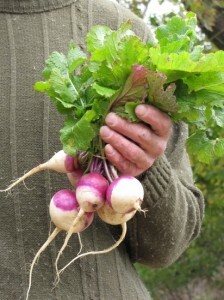 But there are two other great ways to use turnips here on Sixburnersue.com. The first is in a great-technique for a stovetop slow sauté, a recipe called Caramelized Turnips, Potatoes & Carrots, with Onion and Thyme. 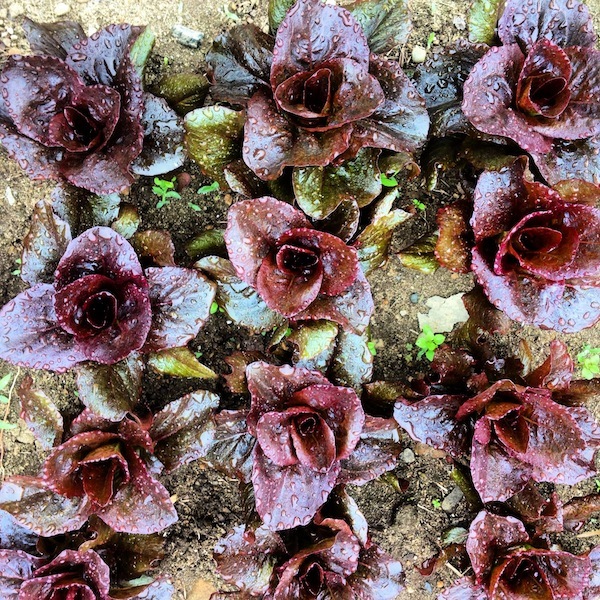 And the second is in a beautiful winter salad. I also have many more turnip recipes in my books, including Honey Roasted Baby Turnips with Cremini Mushrooms in Fresh From the Farm. That’s a super easy recipe. 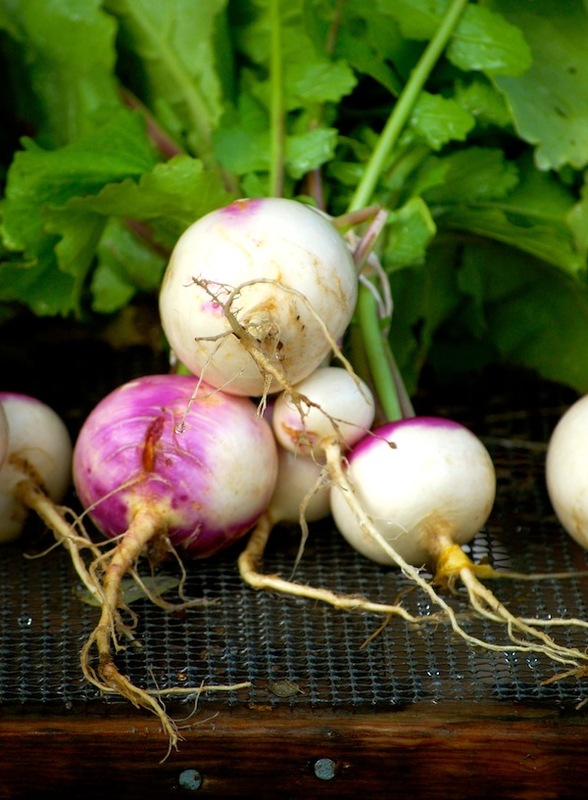 So if you stumble upon some fresh turnips this weekend at your fall farmers’ market, don’t say I didn’t let you know what to do with them! 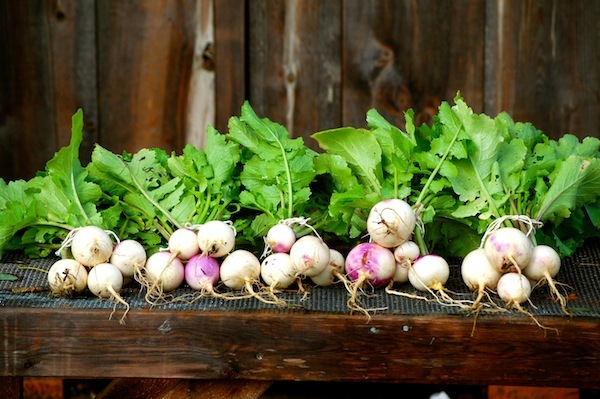 How DO You Cook Those Japanese Baby Turnips, Anyway? 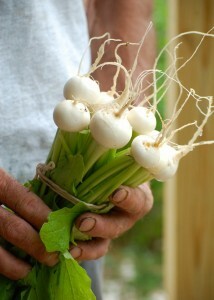 We are just coming to the end of our first-ever harvest of Tokyo turnips, aka Japanese baby turnips. They aren’t really babies, but they are really delicious and beautiful and tender and juicy. (The greens are delicate and tasty, too.) We’ve never grown them (or a similar variety called Hakurei that’s popular at farmers’ markets) before, so I am pretty darn excited that they did well, and I can’t wait to grow more. I’m sure our cool weather helped, so I probably won’t seed again until fall. 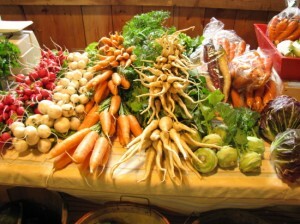 It’s unusual for me to sell a vegetable at the farm stand that I haven’t cooked with much. And while I could certainly guess by the juicy raw texture and flavor that both minimal cooking (steaming, quick-braising, glazing) and browning (roasting, sautéing and stir-frying) would probably work with these, I couldn’t quickly reference one of my own recipes to help people cook them. 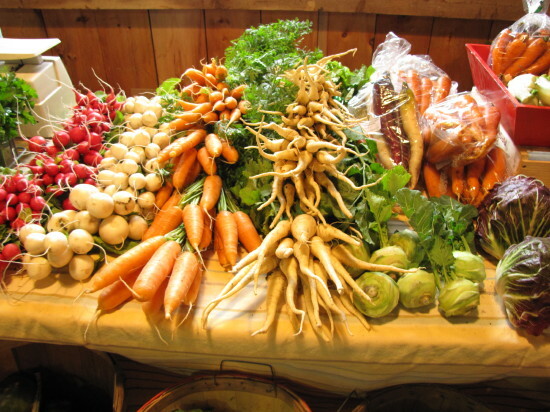 Fortunately, many of our farm stand customers are adventurous and competent cooks, so several of them forged ahead without me! 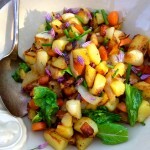 One woman found a recipe for a nice sauté with potatoes in my fellow Island cookbook author friend Cathy Walther’s Greens, Glorious Greens, and on FaceBook, another cookbook author friend, Diane Morgan, suggested finishing a sauté with miso butter. 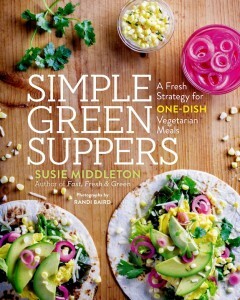 I don’t have Cathy’s Greens book, though I know it’s a classic and well worth checking out, but I do have Diane’s award-winning Roots, and I can tell you there are more than a few really delicious recipes for turnip dishes in it, including one called Kashmiri-Style Turnips with Greens that led me to think I wasn’t crazy to want to pair cilantro (and ginger) with the baby turnips. The cilantro is flourishing in the cool spring garden, alongside the turnip bed. Today (thank God for the rain!) 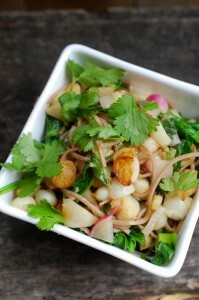 I finally got a chance to mess around with the Japanese turnips in the kitchen. Since we had sold all the good-sized and blemish-free roots at the farm stand, I was left with only teeny-tiny roots and some bigger damaged roots, so I had no choice but to cut everything about ½-inch in size. (That meant no cutting for the teeniest mini-marbles.) 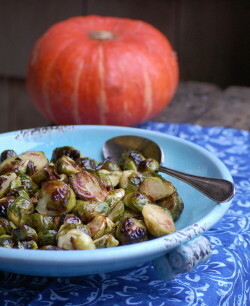 But I think I would favor that size anyway—or wedges if all my roots were similar sized—for the quickest cooking. I did both a quick par-boil and a quick sauté, adding the greens only briefly to wilt at the end in the sauté , and with lemon and butter, found that the baby turnips really do make a super-quick spring side dish. Then I indulged my desire to go Asian, and did a stir-fry with soba noodles—and ate the whole thing for lunch. 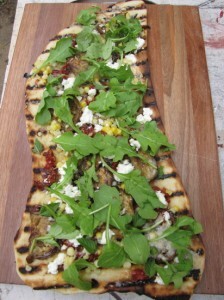 (It would have served two easily with some grilled shrimp. Photos very top and below.) Originally I thought I might go all the way and turn it into an Asian noodle soup, as the greens would be so perfect for one of these. 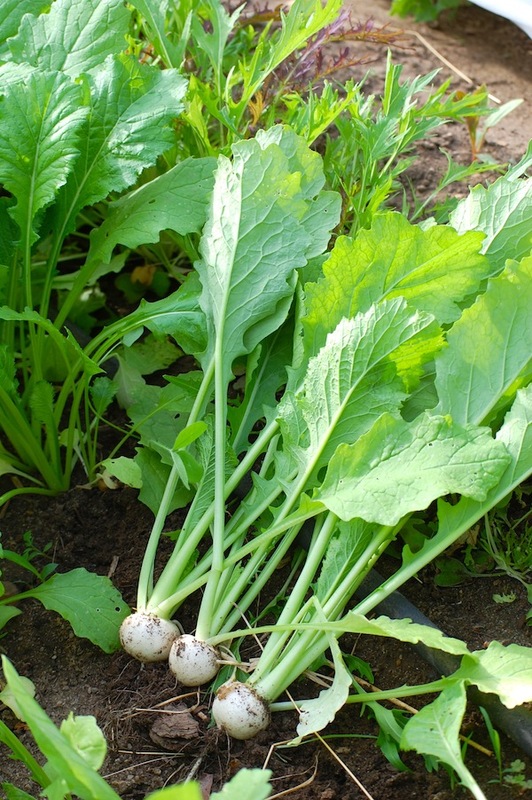 (And one small turnip—generally about 2 inches in diameter—has a lot of greens attached.) 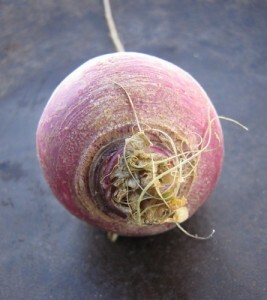 But I was afraid the turnip roots would get lost in the soup, so I kept it noodle-y. I’m including the recipe below in narrative form, as I wouldn’t want to give you a set-in-stone recipe without testing again with more uniform turnips and more exact proportions. P.S. I almost completely forgot. The first thing I actually did with the baby turnips a few days ago was to add them to one of my slow-sautes with carrots and potatoes. I’d forgotten I had a few in the fridge, and cut them just as a i was starting to cook the potatoes and carrots. They cook a little more quickly than purple-topped turnips, so you can certainly use them deliciously in one of these, but I might add them half-way through cooking. Sorry, but if I told you what I’d been doing for the past week or so, I’d have to kill you. Only kidding. It’s not top-secret. Just complicated in the way that only multiple Island-to-mainland round-trip ferry rides can be. Complicated in the wearing-lots-of-hats kind of way. You know, as much as I like being farmette girl, this week I had to wear some of my other hats (as we all do from time to time). 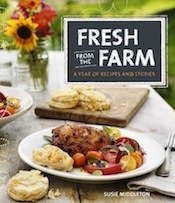 I had to be cookbook author/cooking teacher girl and photo shoot girl, and more importantly, family girl and friend girl. Dr. Seuss would be proud, as I did manage to stack all my hats on my one head all at one time. Anyway, the point is that you would die of boredom if I transcribed my diary, so instead, I’m offering you a timely recipe suggestion today. 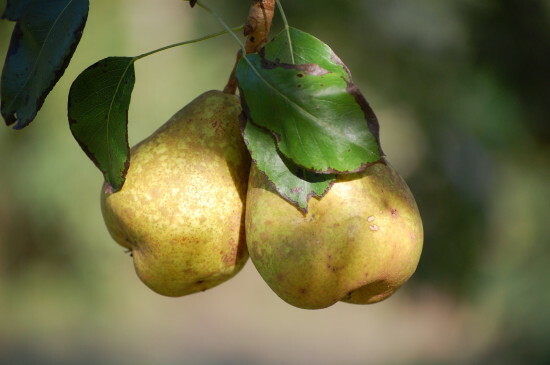 We have been gleaning pears from our neighbor’s pear trees, which were a bit rattled by Irene and are letting loose their fruit like a wet dog shaking off water. 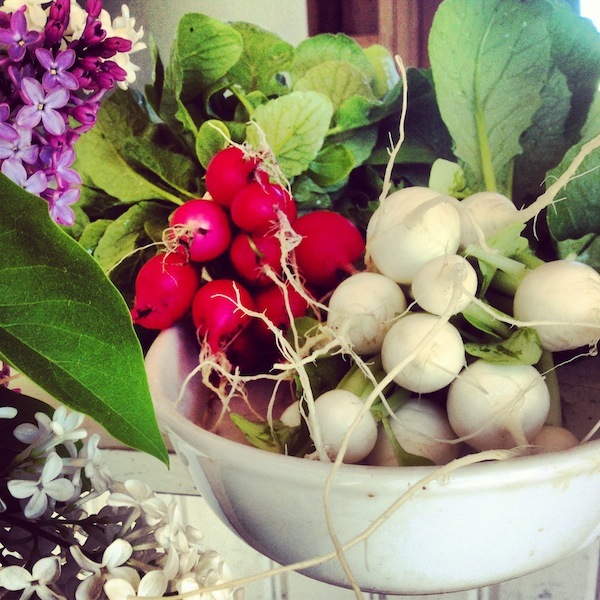 (I said gleaning, not stealing—the neighbors invited us to pick.) 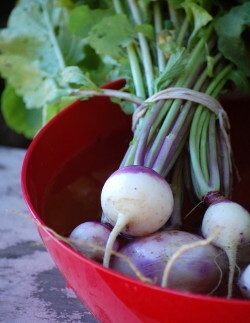 I’ve also been harvesting the purple-topped turnips I planted in July. I am in love with these darn things because they are so pretty and sturdy and useful and delicious all at once. And, as it happens, for some reason (maybe I really was channeling the seasons), when I was writing Fast, Fresh & Green three years ago (that long now! 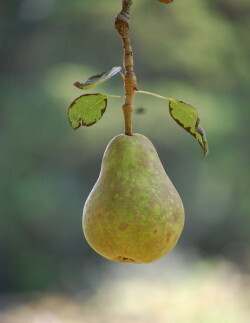 ), I developed a recipe that uses both turnips and pears. It also happens to be drop-dead easy and delicious. It was one of the recipes I demonstrated on Martha Stewart Television last Thanksgiving, and it was also featured in Martha’s Vineyard Magazine (see photo of finished dish). 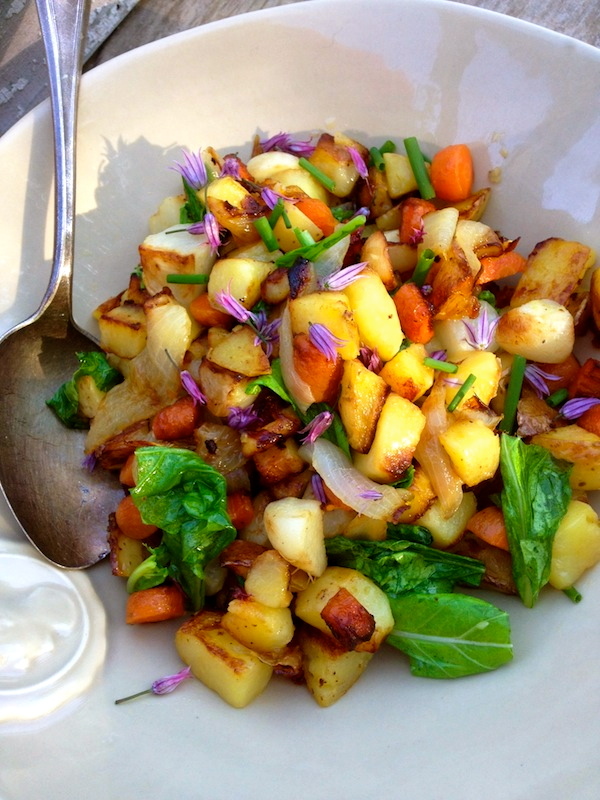 The recipe—for Roasted Turnips & Pears with a Rosemary-Honey Drizzle—came to mind last week not just because of the pear-picking, but because I wanted to give farm stand customers a turnip recipe that might encourage them to experiment. 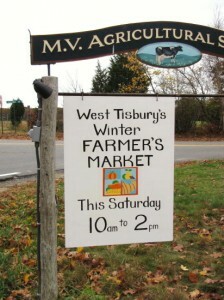 (And I admit, that might get them to buy turnips!) 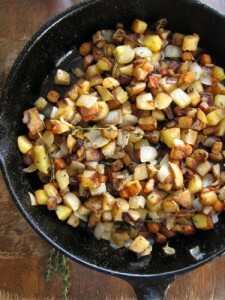 I know people often disdain turnips for their bitter edge, but I find they are delicious roasted, especially when combined with something a little sweet. 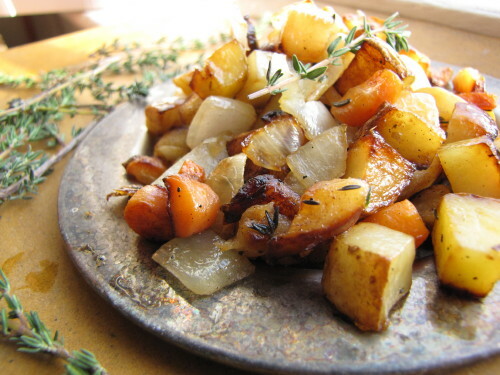 (They are also really yummy in a slow-sauté, like the Caramelized Turnips, Potatoes & Carrots with Onion & Thyme I posted last year.) If you’re turnip-averse, please give this a try. There’s a lovely balance in this autumn side dish between the sweet pears and the, well, not-so-sweet, turnips – and between the floral honey and the piney rosemary. All the flavors come together in a way that just might be palatable for people who normally wouldn’t eat turnips. 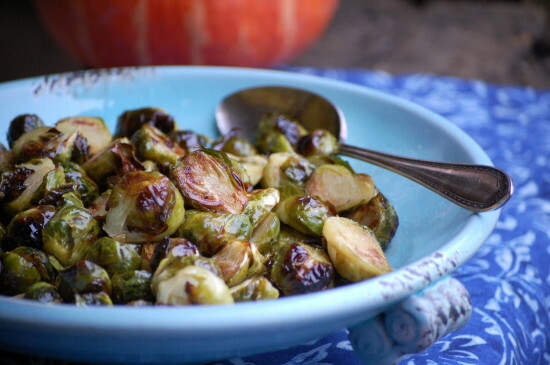 These would be delicious nestled next to a braised lamb shank or some short ribs. Purple-topped turnips don’t need peeling; nor do I peel pears when I’m roasting them, so this is an easy dish to put together. Preheat the oven to 475 degrees F. Line a large (18- x 13- x 1-inch) heavy-duty rimmed sheet pan with a piece of parchment paper. 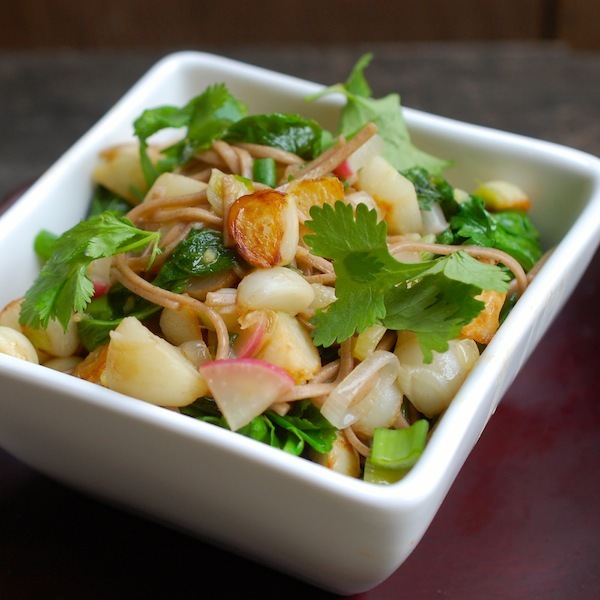 In a mixing bowl, toss the turnips and pears with the vegetable oil and the salt. Spread the turnips and pears in one layer on the sheet pan and roast, flipping with a spatula once or twice during cooking if you like, until the turnips are tender when pierced with a paring knife or spatula, 25 to 30 minutes (the turnips will be brown on some sides, the pears will be a bit darker). 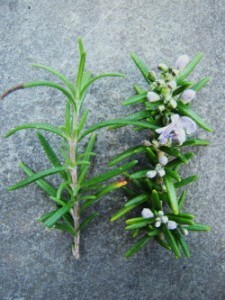 Meanwhile, melt the butter in a small saucepan and add the honey and the rosemary. Simmer for a few seconds and remove from the heat. 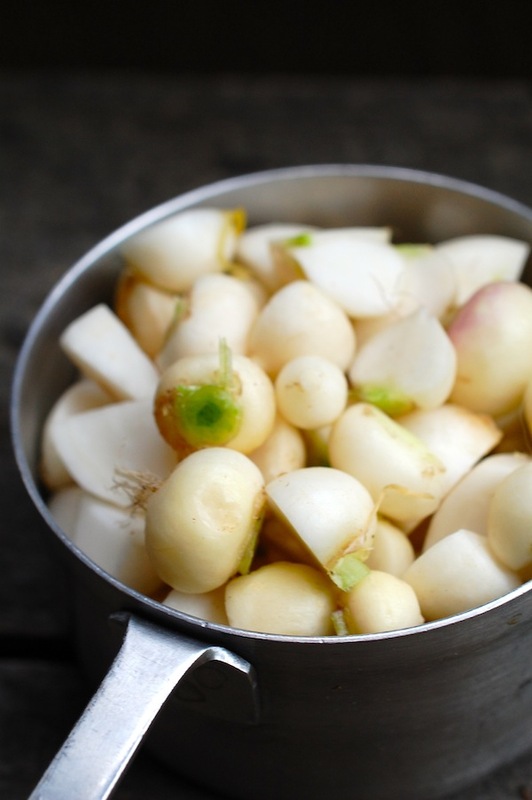 Transfer the cooked turnips and pears to a mixing bowl and drizzle the butter mixture over all, scraping all of the mixture out of the saucepan. Toss well and transfer to a serving dish.